Lisa loves John: Hannah and our adventures... White Sands! Something amazing happened this past Thursday... one of my best friends from Michigan flew in to visit me!! Hannah and I have been friends since high school and I was so excited that she was able to come and stay with John and me in New Mexico. After picking Hannah up from the airport we headed straight to Alamogordo, New Mexico to visit White Sands National Monument (check out the pictures on the website - mine do not do the place any justice). 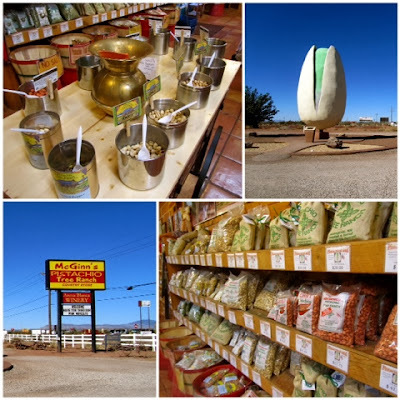 On our way down south, we took a mini detour at a pistachio farm where we taste-tested 10 or so different flavors of pistachios (salt and pepper, lemon lime, ranch, BBQ, garlic, green chile, red chile, etc.) and a few pistachio wines. Shamefully, I ate about a pound of pistachios in two days, and my mouth was sore from all of the salt - but they were soo good and fresh. 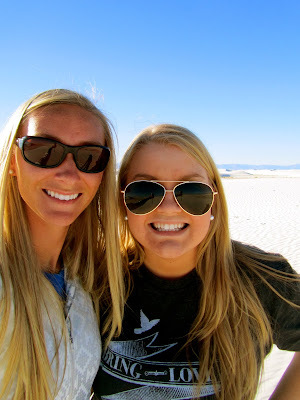 Shortly after our pistachio detour, we made it to White Sands - it was incredibly beautiful and unlike anything I have seen before. The closest comparison that I can think of is Sleeping Bear Sand Dunes, except a million times bigger, no water, and whiter sand that was cold and compact. The sand is actually so compact and firm that many people go there to sled!